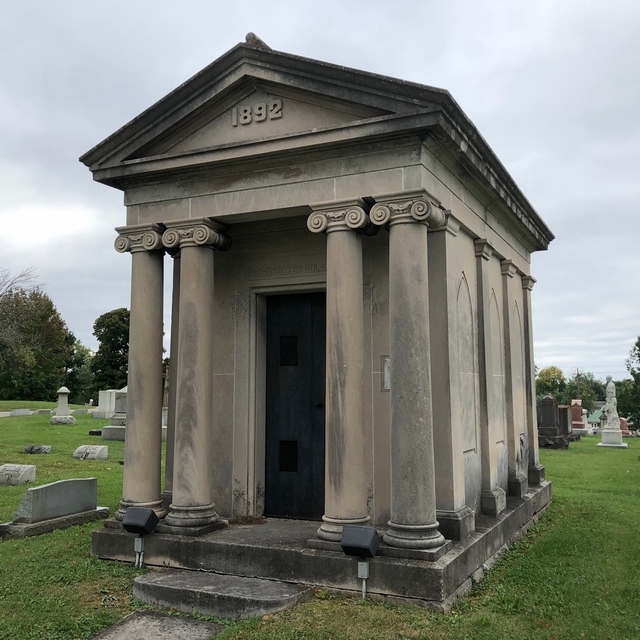 This stately Mausoleum was given to the Greenhill Cemetery Association by Col. Archibald C. Voris for temporary entombment during the cold winter months. In April 1993, the fee for use of a vault was set at 3 dollars for the privilege of remaining one month and 2 dollars for each additional month. Bodies were not permitted to remain longer than three months. The proceeds were to be used for improvement of the cemetery grounds. The Voris Mausoleum has outlived its original purpose. With modern machinery, grave sites can be dug all winter.